On the night of Feb. 20, the full moon will pass intoEarth's shadow in an event that will be visible across all of the United States and Canada. The total lunareclipse will be made even more striking by the presence of the nearbyplanet Saturn and the bright bluish star, Regulus. Eclipses in the distant past often terrified viewers whotook them as evil omens. Certain lunar eclipses had anoverwhelming effect on historic events. One of the most famous examples is thetrick pulled by ChristopherColumbus. On Oct. 12, 1492, as every schoolchild has been taught, Columbus came ashore on an island northeast of Cuba. He later named it San Salvador (HolySavior). Over the next ten years Columbus would make three more voyages to the"New World," which only bolstered his belief that he reached the Far East by sailing West. It was on his fourth and final voyage, while exploring thecoast of Central America that Columbus found himself in dire straits. He left C?diz, Spain on May 11, 1502, with the ships Capitana, Gallega,Vizca?na and Santiago de Palos. Unfortunately, thanks to an epidemic ofshipworms eating holes in the planking of his fleet, Columbus' was forced toabandon two of his ships and finally had to beach his last two caravels on thenorth coast of Jamaica on June 25, 1503. Initially, the Jamaican natives welcomed the castaways,providing them with food and shelter, but as the days dragged into weeks,tensions mounted. Finally, after being stranded for more than six months, halfof Columbus' crew mutinied, robbing and murdering some of the natives, who,themselves grew weary of supplying cassava, corn and fish in exchange forlittle tin whistles, trinkets, hawk's bells and other rubbishy goods. With famine now threatening, Columbus formulated adesperate, albeit ingenious plan. Coming to the Admiral's rescue was JohannesM?ller von K?nigsberg (1436-1476), known by his Latin pseudonym Regiomontanus.He was an important German mathematician, astronomer and astrologer. Before his death, Regiomontanus published analmanac containing astronomical tables covering the years 1475-1506.Regiomontanus' almanac turned out to be of great value, for his astronomical tables provided detailed information about the sun,moon and planets, as well as the more important stars and constellations bywhich to navigate. After it was published, no sailor dared set out without acopy. With its help, explorers were able to leave their customary routes andventure out into the unknown seas in search of new frontiers. Columbus, of course, had a copy of the Almanac with him when he was stranded on Jamaica. 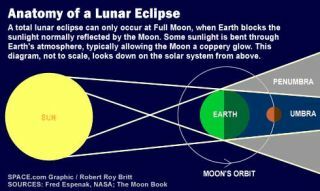 And he soon discovered fromstudying its tables that on the evening of Thursday, Feb. 29, 1504, a totaleclipse of the moon would take place soon after the time of moonrise. Armed with this knowledge, three days before the eclipse, Columbus asked for a meeting with the natives Cacique ("chief") and announced tohim that his Christian god was angry with his people for no longer supplyingColumbus and his men with food. Therefore, he was about to provide a clear signof his displeasure: Three nights hence, he would all but obliterate the risingfull moon, making it appear "inflamed withwrath," which would signify the evils that would soon be inflictedupon all of them. On the appointed evening, as the Sun set in the West and themoon started emerging from beyond the eastern horizon, it was plainly obviousto all that something was terribly wrong. By the time the moon appeared in fullview, its lower edge was missing! And, just over an hour later, as full darkness descended,the moon indeed exhibited an eerily inflamed and "bloody"appearance: In place of the normally brilliant late winter full moon therenow hung a dim red ball in the eastern sky. According to Columbus' son, Ferdinand,the natives were terrified at this sight and ". . . with great howling andlamentation came running from every direction to the ships laden withprovisions, praying to the Admiral to intercede with his god on theirbehalf." They promised that they would gladly cooperate with Columbus andhis men if only he would restore the moon back to its normal self. The greatexplorer told the natives that he would have to retire to confer privately withhis god. He then shut himself in his cabin for about fifty minutes. "His god" was a sandglass that Columbus turned every half hour to time the various stages of the eclipse, based on thecalculations provided by Regiomontanus' almanac. Just moments before the end of the total phase Columbus reappeared, announcing to the natives that his god had pardoned them and wouldnow allow the moon to gradually return. And at that moment, true to Columbus' word, the moon slowly began to reappear and as it emerged from the Earth'sshadow, the grateful natives hurried away. They then kept Columbus and his menwell supplied and well fed until a relief caravel from Hispaniola finallyarrived on June 29, 1504. Columbus and his men returned to Spain on Nov. 7. In an interesting postscript to this story, in 1889, Mark Twain, likely influenced by theeclipse trick, wrote the novel, A Connecticut Yankee in King Arthur's Court.In it, his main character, Hank Morgan, used a gambit similar to Columbus'. Morgan is about to be burned at the stake, so he"predicts" a solar eclipse he knows will occur, and in the process,claimed power over the sun. He gladly offers to return the sun to the sky inreturn for his freedom and a position as "perpetual minister andexecutive" to the king. The only problem with this story is that on the date thatMark Twain quoted — June 21, 528 A.D. — no such eclipse took place. In fact,the moon was three days past full, a setup that can't generate aneclipse. Perhaps he should have consulted an almanac!